Add dimension quickly and consistently to your metalwork by using a hydraulic press. It is ideal for making forms with patterned metal, building a production line, beginning a chasing project and much more! This is a fun and easy way to add texture, unique shapes and dimension to your art work. 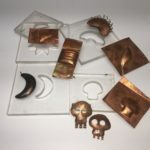 You will learn how to make a die using various materials. We will experiment with folds, cuts, and holes while using tons of pressure to form our metal. Basic metal working experience recommended. Some experience with metal recommended.